An undated newspaper cutting can be seen here (in text) or here as an image file that highlights the existence of Muggletonianism following the gift of Dr Williams Muggletonian collection to the London Library, it provides the rather interesting observation that "in London there are but "a mere handful" of Muggletonians, but in Derbyshire about 40 meet at times." This cutting was found in a copy of "The Third Testament of Our Lord Jesus Christ"" and is undated, although on the rear a date of 1920 is visible, although this may have been a reference to a past event. This paper was originally presented in 1915 and it represents a similar work to Alexander Gordon's"Ancient and Modern Muggletonians" to which it is obviously highly indebted. 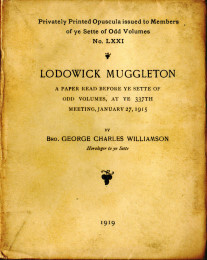 Saying that this work records the authors contact with the Muggletonians in the early 1900's and Williamson boasts of his acquisition of the Muggletonian song book, a feat that was beyond Alexander Gordon. All in all a very interesting work and one of the few that records the activities of Muggletonians in the twentieth century.